To increase the effectiveness of the ad, please include a link upon submission. Deadline: Advertisements must be submitted by the 25th of the month prior to publication. Size: 640 pixel x 100 pixel. 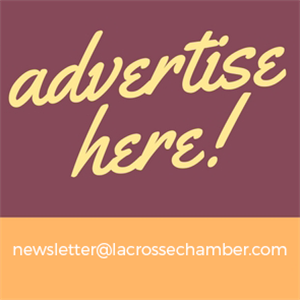 Please submit your ad below before adding to cart or email it to newsletter@lacrossechamber.com. Sent out for 4 consecutive weeks to over 1,700 business professionals. Include a clickable link. Sent out monthly to over 150 business professionals in our Young Professionals of the Coulee Region group. This is a sure way to build your company as a resource to a very targeted audience.